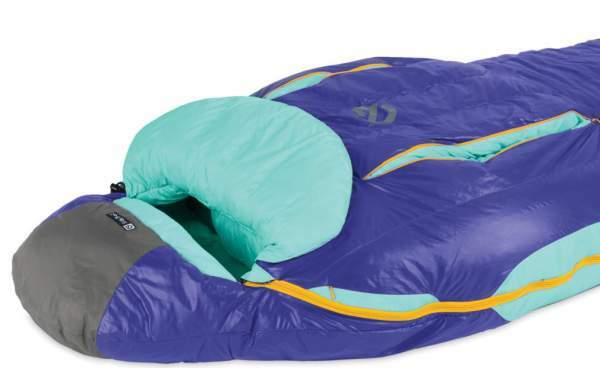 Nemo Women’s Cleo 15-Degree Down Mummy Sleeping Bag is an advanced patent-pending design and a backpacking sleeping bag for at least 3 seasons, with a down fill and some truly great features. NEMO Cleo 15 Sleeping Bag for women. This NEMO Women’s Cleo 15 is a backpacking bag with a great temperature rating which will protect you in any conditions in a 3-season use and even more than that. It is a mummy style bag as you realize from the picture so the size and shape are what you would expect from such a type, I mean this is a snug design. You will notice that baffles are longitudinal and there is a reason for that; they use such a design so that the heat moves through the insulation along the bag so that you have a better temperature balance in particular in the feet zone which is usually the most critical. 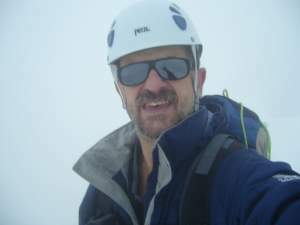 I have just returned from the Alps where I have experienced this in my own bag. This is a women-specific design and they build the bag in two sizes R and L, see more in the specifications below. Note that they also have a corresponding model for men which they call NEMO Ramsey 15 sleeping bag. This is a bag with several useful bonuses, so let me go through them. The hood is quite large but you can cinch it down completely on cold nights. The fabric is really soft and it is with a coating to protect the fill from the moisture. You have the temperature rating 15 F (-9 C) so this is a warm bag suitable even for rather low temperatures. As usual, for a comfort, I would add some 10 degrees up, so I see it as a very good 3-season bag. This insulation is achieved by using a 100% Responsible Down Standard (RDS) Certified down which is traceable and they claim it ensures a “humane treatment throughout the supply chain”. This is the 650 Nikwax-treated down which provides the water-repellency. So it remains dry longer and it also dries faster if it becomes wet, than an untreated down. The mentioned temperature rating is such that the bag may look too warm for a warmer environment. But you have two-way main zippers for ventilation and in addition, it comes with integrated thermo-gills. If you are puzzled by this, just to know – this is about two short zippers which you have on the chest, they are visible in the picture below. So you can unzip them and get some fresh air if you feel warm, while still keeping the main zipper closed. This should be good enough to regulate the temperature up to 20 degrees or so. Several bonuses are visible – the thermo gills, Blanket Fold, and the waterproof hood layer. This is a small extension which you see under the opening, see the picture above. You can use it during cold nights to prevent drafts, or you can push it out if you feel warm. In the feet area and on the top of the hood, they use a different fabric, 40D nylon ripstop OSMO DWR which is waterproof but breathable. This is a great addition because of the condensation on the walls, those are the parts of the bag that are most frequently in contact with the walls. The stuff sack is with compression straps. Sizes: regular (R) & long (L). Minimum weight: 2 lb 12 oz (1.26 kg). Temperature rating: 15 F (-9 C). Packed size (L x D): 12 x 7.5 in (30 x 19 cm). – R: 5 ft 6 in (168 cm). – L: 6 ft (183 cm). – R: 74 in (189 cm). – L: 78 in (198 cm). Fill weight: 1 lb 10 oz (750 g). – R: 56 in (142 cm). – L: 58 in (147 cm). – R: 53 in (135 cm). – L: 55 in (140 cm). – R: 51 in (130 cm). – L: 53 in (135 cm). In the table below I give this NEMO’s bag side by side with two bags from the other top brands, all the sizes for women, so you can better understand its features. As you realize, it is in between the other two regarding the weight and the packed size. But check also the prices, so please follow the links in the table. 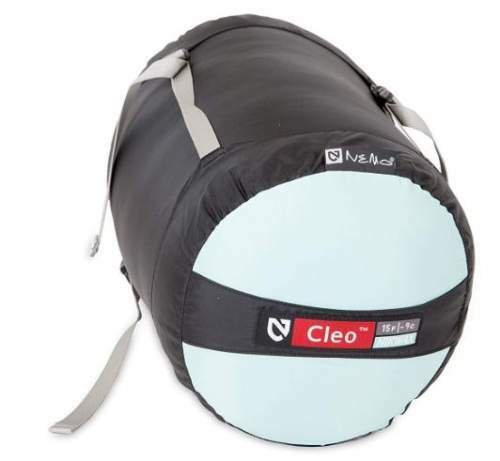 In the summary of this Nemo Women’s Cleo 15-Degree Down Mummy Sleeping Bag review, I can only stress again that this is a top-quality item from a renown brand that is at the forefront in this industry. So although the price is high, you know what you are buying and this item is worth the investment. On the other hand, if you check the models given in the comparison table above, you realize it is roughly the same price as the Marmot’s bag, but it is only half the price of the Big Agnes’ bag. Now you realize why it is important to make comparisons like this, it put the things into perspective and you can make an informed choice. All in all, I have no doubt, this bag is a reliable backpacking and hiking item. In any case, if you need more options, please check my list with best 3-season sleeping bags, or just visit my page with bags, you will see some great options there. Check also these Marmot Women’s Ouray 0 Degree and Big Agnes Orno UL 0 Degree Sleeping Bag that are for winter backpacking. Thank you for reading and please use the comment box below in the case of questions and comments. I wish you a nice day. Filed Under: Mountain climbing equipment, Sleeping bags and pads Tagged With: NEMO Cleo 15, NEMO Cleo 15 Sleeping Bag for women.